Erika Tymrak scored her first goal of the season and Utah Royals FC earned their second win of the year — 1-0 over Houston Dash to kick off Week 8 in the NWSL. The win — in front of a crowd of 8,323 at Rio Tinto Stadium in Sandy, Utah — came in the final game of a four-game home stand for Utah. Utah Royals FC are now 2-1-5 (11 pts) and unbeaten in their last five (2-0-3 in that stretch). The loss for the Dash snapped a three-game unbeaten streak and dropped them to 1-4-4 (7 pts). Utah played the game without Kelley O’Hara, who has a right hamstring strain. O’Hara had been playing at forward the last few matches — and in her absence on Saturday, Tymrak started in her place on the front line. The start for Tymrak was her first of the season and she netted the game-winning goal in the 51st minute. Gunnhildur Jónsdóttir won the ball in her own half and ran down the right sideline, well into the offensive third. She then passed across the top of the penalty box, while Amy Rodriguez and Tymrak made runs to her left. Rodriguez turned, but didn’t play the ball, letting it go past her and to Tymrak, who hit a one-time shot with her right foot past Dash goalkeeper Jane Campbell. Utah Royals FC had a chance to take the lead in the first half after Amber Brooks was called for a foul on Rodriguez in the box. Utah midfielder Diana Matheson stepped up to take the penalty kick, but her shot was saved by Campbell. For Matheson, who missed all of the 2017 season with an ACL tear, it was her first PK attempt since the 2016 NWSL Championship with the Washington Spirit, which was saved by Sabrina D’Angelo to give the Western New York Flash the win. Rodriguez also had a chance a few minutes earlier, but Campbell turned away her shot. The Dash did not record a shot on goal in the game, according to Opta — the third time that’s happened this season. In their first meeting with Utah Royals FC, a 0-0 draw on March 30, they also did not record a shot on target. Utah outshot Houston 18-7 (5-0 in shots on goal) and controlled possession 63.7% to 36.3%. They also led in passing accuracy 80.5% to 62.1%, but the Dash earned more corner kicks (4-2). The Dash will next be in action on Wednesday night at home vs. Seattle Reign FC, who entered Week 8 in second-place in the NWSL. Utah Royals FC head to Portland to take on the Thorns on Friday night. Match ends, Utah Royals 1, Houston Dash 0. Second Half ends, Utah Royals 1, Houston Dash 0. Attempt blocked. Katrina-Lee Gorry (Utah Royals) right footed shot from the right side of the box is blocked. Assisted by Taylor Lytle. Attempt missed. Rachel Daly (Houston Dash) right footed shot from outside the box misses to the right. Assisted by Linda Motlhalo. Corner, Utah Royals. Conceded by Thembi Kgatlana. Attempt blocked. Kristie Mewis (Houston Dash) left footed shot from outside the box is blocked. Assisted by Linda Motlhalo. Haley Hanson (Houston Dash) wins a free kick in the defensive half. Substitution, Utah Royals. Katie Bowen replaces Brooke Elby. Substitution, Houston Dash. Thembi Kgatlana replaces Nichelle Prince. Attempt missed. Erika Tymrak (Utah Royals) right footed shot from the centre of the box is too high following a set piece situation. Attempt blocked. Amy Rodriguez (Utah Royals) right footed shot from outside the box is blocked. Assisted by Gunnhildur Yrsa Jonsdottir. Substitution, Houston Dash. Linda Motlhalo replaces Kyah Simon. Attempt missed. Allysha Chapman (Houston Dash) left footed shot from outside the box is high and wide to the left following a corner. Attempt missed. Gunnhildur Yrsa Jonsdottir (Utah Royals) right footed shot from outside the box is too high. Substitution, Utah Royals. Taylor Lytle replaces Diana Matheson. Erika Tymrak (Utah Royals) wins a free kick in the defensive half. Attempt missed. Amy Rodriguez (Utah Royals) right footed shot from outside the box misses to the right. Assisted by Katrina-Lee Gorry. Attempt missed. Amy Rodriguez (Utah Royals) right footed shot from outside the box misses to the left. Assisted by Erika Tymrak with a through ball. Attempt blocked. Katrina-Lee Gorry (Utah Royals) right footed shot from outside the box is blocked. Assisted by Diana Matheson. Haley Hanson (Houston Dash) wins a free kick in the attacking half. Goal! Utah Royals 1, Houston Dash 0. Erika Tymrak (Utah Royals) right footed shot from the centre of the box to the bottom left corner. Assisted by Gunnhildur Yrsa Jonsdottir. Attempt saved. Amy Rodriguez (Utah Royals) left footed shot from the left side of the box is saved in the top left corner. Assisted by Gunnhildur Yrsa Jonsdottir with a through ball. Attempt missed. Kyah Simon (Houston Dash) right footed shot from outside the box is high and wide to the right following a corner. Attempt blocked. Rachel Daly (Houston Dash) right footed shot from outside the box is blocked. Assisted by Kristie Mewis. Second Half begins Utah Royals 0, Houston Dash 0. First Half ends, Utah Royals 0, Houston Dash 0. Attempt blocked. Amy Rodriguez (Utah Royals) left footed shot from the right side of the box is blocked. Assisted by Gunnhildur Yrsa Jonsdottir. Attempt saved. 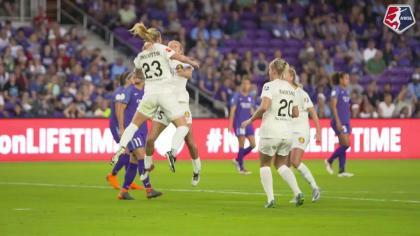 Katrina-Lee Gorry (Utah Royals) right footed shot from outside the box is saved in the top left corner. Diana Matheson (Utah Royals) wins a free kick in the attacking half. Delay in match Rebecca Moros (Utah Royals) because of an injury. Delay in match Allysha Chapman (Houston Dash) because of an injury. Corner, Utah Royals. Conceded by Amber Brooks. Attempt missed. Gunnhildur Yrsa Jonsdottir (Utah Royals) header from the right side of the six yard box is too high. Assisted by Katrina-Lee Gorry with a cross following a set piece situation. Penalty saved! Diana Matheson (Utah Royals) fails to capitalise on this great opportunity, right footed shot saved in the bottom left corner. Penalty Utah Royals. Amy Rodriguez draws a foul in the penalty area. Penalty conceded by Amber Brooks (Houston Dash) after a foul in the penalty area. Erika Tymrak (Utah Royals) wins a free kick on the right wing. Attempt missed. Amy Rodriguez (Utah Royals) right footed shot from outside the box is close, but misses to the left. Assisted by Katrina-Lee Gorry. Dangerous play by Katrina-Lee Gorry (Utah Royals). Attempt missed. Kyah Simon (Houston Dash) left footed shot from outside the box is high and wide to the left. Assisted by Rachel Daly. Attempt missed. 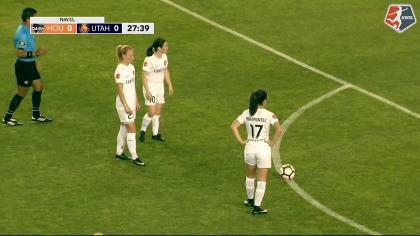 Katrina-Lee Gorry (Utah Royals) right footed shot from outside the box is close, but misses to the left. Attempt missed. Erika Tymrak (Utah Royals) left footed shot from the centre of the box is close, but misses to the right. Brooke Elby (Utah Royals) wins a free kick on the right wing. Delay in match Desiree Scott (Utah Royals) because of an injury. Brooke Elby (Utah Royals) is shown the yellow card for a bad foul. Foul by Brooke Elby (Utah Royals). Attempt saved. Katrina-Lee Gorry (Utah Royals) left footed shot from outside the box is saved in the bottom left corner. Assisted by Gunnhildur Yrsa Jonsdottir.